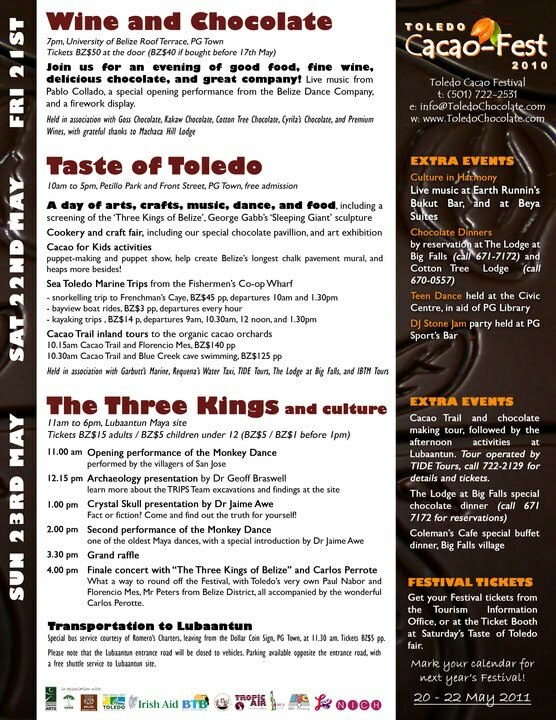 The Toledo District will be hosting its fourth annual Cacao Festival in Southern Belize, on May 21- 23th, 2009. The festival was organized by the Toledo Chapter of the Belize Tourism Industry Association and the Toledo Cacao Growers Association which is based in Punta Gorda Town. 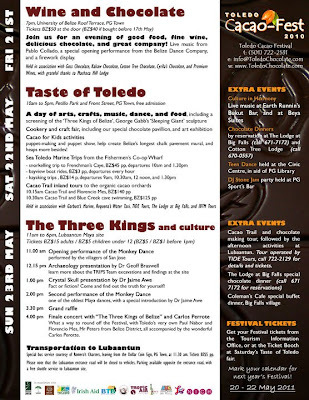 This festival is a celebration of chocolate; the culture and flavors of the Toledo District, and is fast becoming a regular feature for the Belize Tourism Industry. Visitors come from all over Belize and abroad. The Toledo District is the original home of organic cacao and Belizean chocolate in Belize. The Festival opens with its signature Wine and Chocolate evening, held on the rooftop terrace of the University of Belize. Guests will enjoy fine wine and food, chocolate delights from Belize's four chocolate producers - Kakaw, Goss, Cotton Tree, and Cyrila's - live music, from Pablo Collado, and a fireworks display. The Toledo Cacao Growers Association (TCGA) represents over 200 cacao growers in Southern Belize and co-ordinates the production and sale of the beans to Green & Black’s in the United Kingdom where it is transformed into the world renowned Mayan Gold Chocolate. Green & Black’s provide technical expertise and assistance to farmers, from growing and planting seedlings to the harvesting and fermenting process. 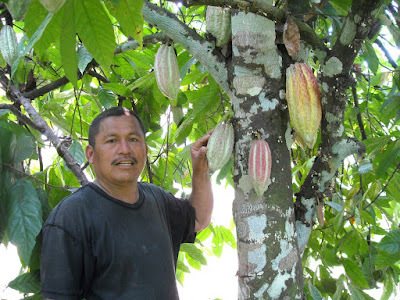 The cultivation of cacao orchards is grown in the shade of other trees and since the farmers do not have to cut down the forest, this makes it the best situation for the environment. 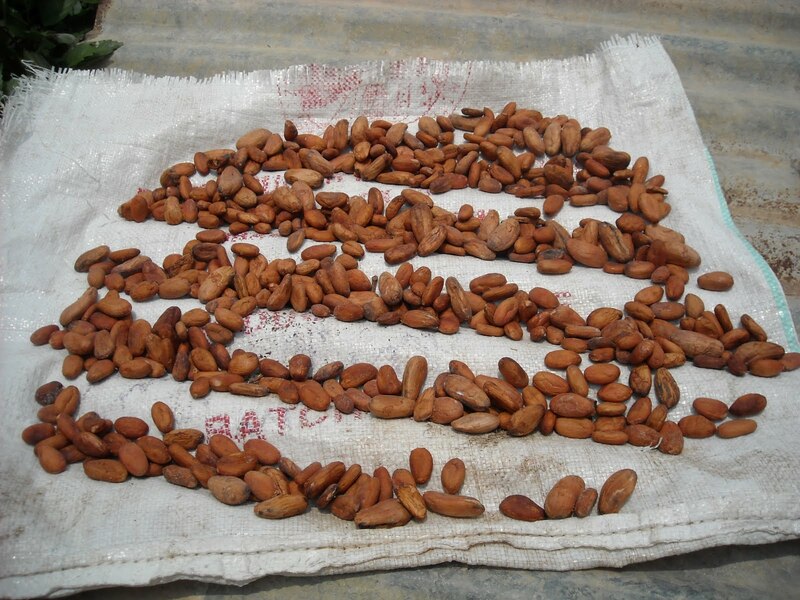 The farmers are paid a premium rate for the cacao beans that are grown organically. Green & Black’s along with the TCGA is making a difference to the economy and the people of Southern Belize. This is what Im talking about. For a country's economy to grow, it needs to be producing something that other countries need. Bravo! Wish I could be there for the festival. By the way Linda, I am thinking that I have bought chocolate made from the company Green and Black. Good information. Thank you so much for the information ...... I finally got the opportunity to see the cocoa beans. You are amazing beyond belief and I admire you. Continue making it a sensational day for so many people.